I guess everyone has watched the phenomenal movie Jab We Met. I have assumed that its everyone favourite or am I wrong? Are there any haters out there? Well its been 9 years since the movie's release but I have not found anyone. Okay enough. Let me come to the point. As the movie starts Geet misses her train. This is something I don't even remotely dream of. But mishaps do occur...sometimes or at least once. Our anniversary trip to Dalhousie was a first in many ways. It was our first family trip. We have travelled to Dubai with my parents before but this time our daughter was also with us. Also it was the first time that we were travelling to a cold place in winters. And lastly, the feature of today's post is 'the train'. This trip was planned in a very short time but a very awaited one. The terrorist blasts at Pathankot was a dampener but finally we booked the tickets. The way to Dalhousie is pretty simple..an overnight train journey from Delhi to Pathankot. Then a five hour drive from Pathankot to Dalhousie. 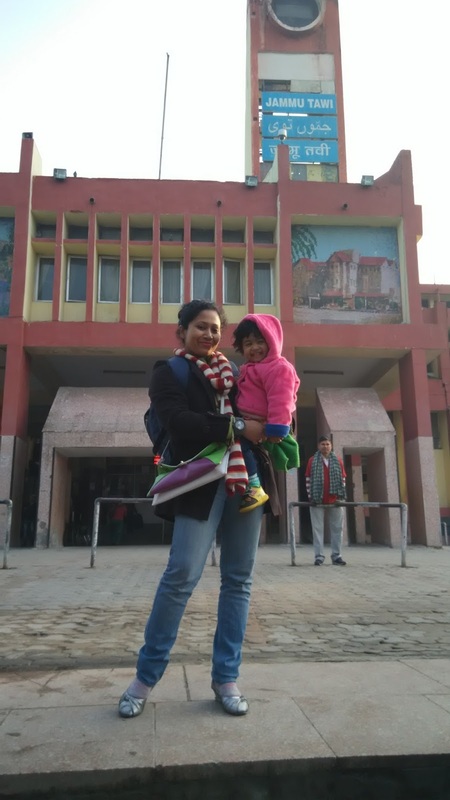 This was the also the first time we boarded a train from the Sarai Rohilla railway station. The train was scheduled to reach Pathankot at five in the morning. It was during the bitter winters of January end. We set our alarms at half past four and we slept in our berths. We woke up as the alarm rang and learnt that our train was two hours late. We had just crossed Ludhiana. We were just relaxing and we did not know when we snoozed into deep slumber. Our sleep broke at half past six. We were relaxed thinking that our station was yet to come. I tried operating my phone but then someone beside said that roaming was not applicable after crossing the state of Punjab. What? Where were we then? We had missed our stop of Pathankot and had now entered the state of Jammu. Oh my goodness...now what? We were almost going to reach jammu. Now we had two options. Either we could take a car from Jammu to Pathankot or leave for kashmir from Jammu. Taking a roadtrip from Jammu to Pathankot meant a travelling time of at least 5 hours plus a good amount of money. Leaving for Srinagar ,Kashmir included a travelling time of at least 12 to 13 hours and then coming back to Jammu and then to Pathankot. Our return ticket was from Pathankot too. Since it was a such a short trip, wasting time by going to Srinagar would not be a good idea. So we took a tough decision and decided to travel back to Pathankot. As soon as we deboarded from the train we did not lose any time in wandering around the Jammu Tawi station. We went to the pre paid taxi booth and booked a Swift Desire to Pathankot. It not only cost us a huge amount of money but an assured travelling time of at least 5 hours. Initially we all were in a foul mood. Just a waste of precious travel time as well as money. Surprisingly, my workaholic father who never sleeps during travelling, dozed off. He must be so exhausted. It was a much needed vacation for everyone of us. As we cruised through the scenic landscapes of Jammu, our moods became better. We stopped in between for tea. Then we came to the border of the state of Punjab. It was my first time in Punjab. I was elated. We had started our road trip at around nine and we reached Pathankot at around one. From there again we booked a taxi to our final destination Dalhousie. The way to Dalhousie as expected was very scenic. We stopped midway at the beautiful mustard fields. The way was twining around the hills. So any person who has motion sickness would be compelled to throw up a lot. We were already exhausted from the long train journey and a longer road trip. And then again a road trip along the hills was too much for all of us. I particularly salute my twenty month old daughter who did not vomit for even once. Finally at around five, we raeched Dalhousie. It was almost dark. We could feel the chill in the air. We lost an entire day. We were supposed to reach Dalhousie at around eight in the morning and it was five. We parked our car (we boooked it for our entire trip). WE breathed a sigh of relief. WE finally reached Dalhousie which seemed nearly impossible in the morning. Welcome to the hills! Finally we reached Himachal Pradesh! What a sweet post your baby so adorable. JAb we met is my fav movie too...n sometimes things work for teh better, so just chill and enjoy. Your daughter is so sweet :) And I'm not used to seeing you in winter clothes! I want to replicate your trip. It's look so much fun. You had your Jab We Met moments. Lovely pictures. Different pictures would have make it different and worthy post ! !